This is another basket which has a whole variety of names. They include muirlag, murlag, crealagh, craidhleag or mudag. Dwelly’s lists ‘craidhleag’ as an egg shaped basket for balls of worsted. 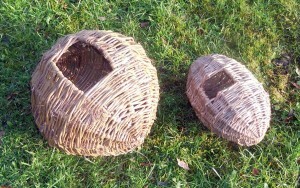 And it has the mudag as a wool basket about 3′ in height made of straw. 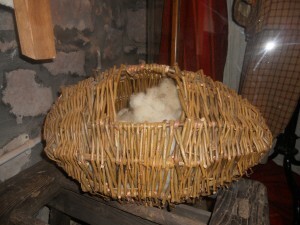 The top part of the mudag called a’ghuite’ being used for holding carded wool, and when spinning the uncarded wool was placed in the bottom part. (1) So maybe we are talking about different designs rather than different names for the same basket.